Nothing gets my anxiety level higher than petro-plastic bags & wraps. Plastic takes hunreds of years to decompose while it does nothing but ensconce a loaf of bread or piece of meat that will be digested in days. Even organic foods comes wrapped in it – ouch. I am trying to let go of that which I cannot yet change so I breathe deeply and re-use and recycle. Mine is a real and not ideal household. Cooking is not my forte and I buy a fair amount of frozen food rather than let paper wrapped foods go bad; using petro oil bad, killing animals needlessly, worse. Not all family members are as committed to zero waste as I am, so I attempt to keep damages to a minimum, thusly. If you have identifiable containers or spaces for each, the process becomes easy for you and family members. A) GROCERY/DRUGSTORE/TAKEOUT bags, BREAD & other hole-less bags of suitable size. Place with dog supplies for dog poop on walk or with cleaning supplies to line trash cans. IKEA sells a handy durable dispenser to attach inside a cabinet door for. B) XL/UNUSUAL shaped bags: Keep a few for future storing/protecting/carrying needs. I keep these with large handled paper bags. D) RECYCLE @ GROCERY: Every other flexible PETRO-plastic. More details below. E) Is the plastic CRUNCHY & CRINKLY? Chances are good that it is actually a bio-plastic i.e. made of cellophane, corn, etc. See below. CATEGORY C: Zippered plastic bags. I pay more for the heavy duty kind with good zippers that work more than once; I probably get at least 10 uses out of each bag. Wash with soapy water, cold rinse (germs thrive in warm but not cold water; boiling temps that would kill germs will melt the bags). 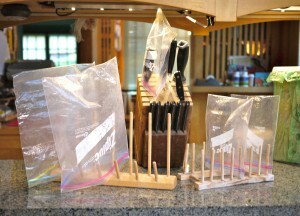 I have a couple sets of wooden upright plate racks that I keep just for bag drying as well upending them on my knife block when I run out of space. As I wash them I check for leaks and mark leaky bags with an X in permanent marker so I don’t reuse for airtight situations. I put them back in the boxes they came from. I feel comfortable re-using mine for food; others may not. I use the newer looking ones for food, the sadder ones for myriad uses. It feels like a lottery winning when I take in an XL zipper bag from frozen chicken pieces. Great for storing camping supplies or other large items in dirty places such as garages or attics. Keeps dust out of craft supplies.